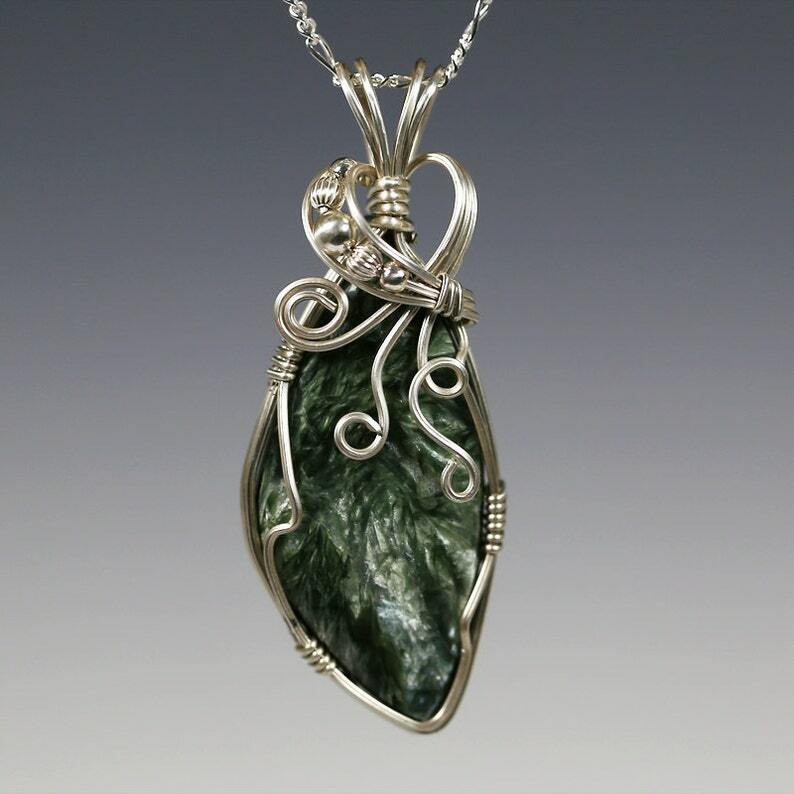 I made this pendant by wrapping this wonderful genuine seraphinite gemstone in sterling silver wire. I created loops of sterling silver wire cascading down the front of the pendant, and added five sterling silver beads across the top of the pendant as accents. The seraphinite is a forest green with a bluish tinge. It has irradiating blades of crystals visible on its surface. The seraphinite stone is a designer freeform cabochon, cut by lapidarist Ed Orekar of Stones in Motion. It is a curved triangular shape, measuring approximately 42mm by 26mm. The pendant measures approximately 2 1/4 inches (5.8cm) in overall length. This pendant comes with a 17" (43cm) sterling silver figaro chain with a small sterling silver lobster clasp. Little Lapis Lazuli Pendant. Sterling SilverNecklace. Genuine Gemstone. September Birthstone. Small Pendant. I got this as a gift for my sister. It is beautiful, well-crafted and exactly as described. She loves it! This is a gorgeous Holly Blue Chalcedony pendant with a high quality gemstone and very artsy design! The color is so beautiful! This pendant is a true artisan piece. The workmanship is perfectly executed and the details are very, very fine! Service was outstanding, speedy shipping and arrival! Thank you, Michele!